The Meeker Homestead Museum,a Historic Home , a two-story brick house built in 1823, overlooking the river is an excellent example of an early Federal style “I House”. The “I House” is a simple form consisting of a rectangular two story house with a gabled roof. They normally had two rooms down and two rooms up, with the entrance hall and stairs in the middle, and chimneys at either end. The front, main body of the house was built first. A a two story rear “ell” was built later, adding two large rooms downstairs, each with a fireplace, and four bedrooms upstairs. Newer single story frame additions were added to the inside corner of the ell at different times during the second half of the twentieth century, and a basement extension was added off the south end for office space. The nearly 200-year-old house remains in a remarkable state of preservation, inside and out. The windows and doors are mostly original to the construction, and the interior woodwork is walnut, painted in the formal parts of the house. The recesses surrounding the fireplaces have original wood cabinetry with paneled doors and trim, and the floors in the old portions of the house are original ash planking. 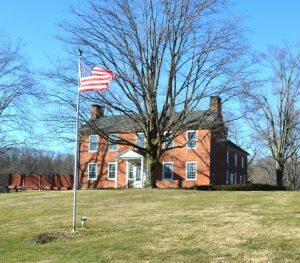 The Forrest Meeker House, one of the oldest and most prominent historic homesteads in Delaware County, is being transformed to a fine educational museum of the early settlement period of the Ohio country. The Delaware County Historical Society is proud to share this wonderful piece of our heritage with the community. Click here for directions to Our Locations.